This week her nails have a side of caviar to see what it looked like. 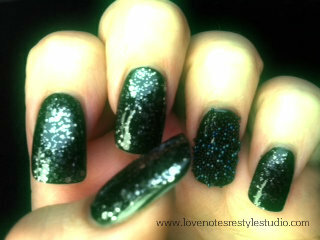 The lovely Karen at Burnside Beauty & Nails used Ciaté Caviar polish in black pearl for this design. Karen hasn’t used it before so they were both experimenting. This design was done on her right hand which is her dominant hand and her pen would sit against the inside of that nail, which is how she thinks she lost most of the caviar balls. Other than that, they have lasted much better than she was expecting. I love this color, beautiful!! Thanks so much for sharing at the Adorned From Above Blog Hop. Your nails are beautiful. Thanks so much for sharing at Wednesday’s Adorned From Above Blog Hop. This weeks party starts at midnight tonight. I can’t wait to see what you have been up to.